After walking through the arched brick opening at the covered entry porch, you find yourself in a foyer space with a view to the formal dining room. Two bedrooms to the right of the foyer share a full bath. 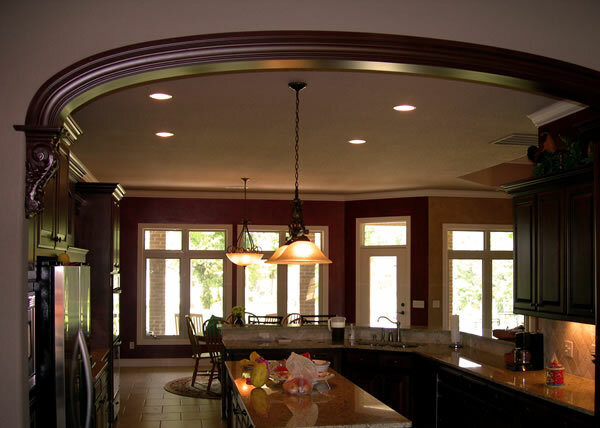 Decorative arched openings separate the foyer space from the main living spaces. The great room straight ahead has a raised ceiling, a stone hearth in one corner, and a wall of glass windows at the rear. A door from the great room opens onto a covered porch at the rear, which has a roof that's supported by brick veneer columns. 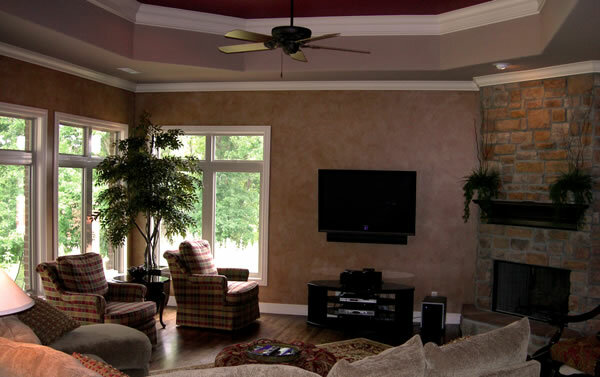 The great room is open to the kitchen and breakfast area, which has a wall for built–ins or a media center. 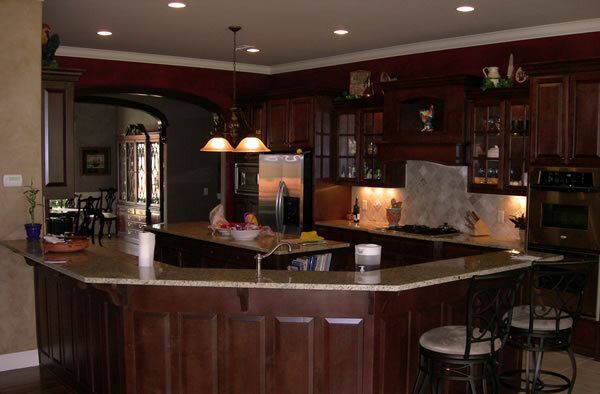 The open kitchen has a center island, and is conveniently located across from the dining room. A small hall located next to the breakfast area leads to a study and a master suite. The master bedroom has a door that opens onto a covered porch, which is also accessed by the study, and the master bath features a Jacuzzi tub, a separate shower, a private toilet room, and a walk–in closet. Next to the kitchen are a laundry room and a small hall that leads to a powder room, a stairwell, a three–car garage, a guest room/office, and back to the front foyer hall. The guest room has its own walk–in closet, and a pair of doors to a covered porch that faces the front. The garage space is divided into two sections. One section holds two cars, and the second section is an oversized one–car garage, with room for a shop/storage area. The upper level features a family room/recreation room, and a room for a home theater. 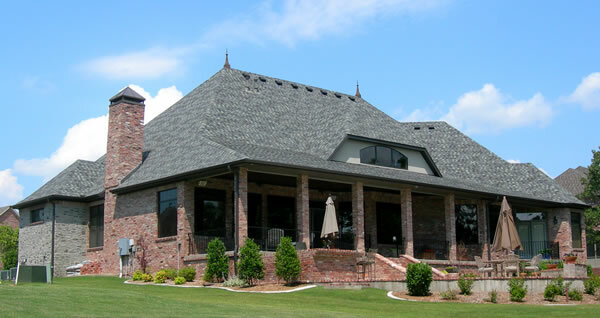 These plans include 3 foundation options – for a slab, a crawlspace, and a basement. 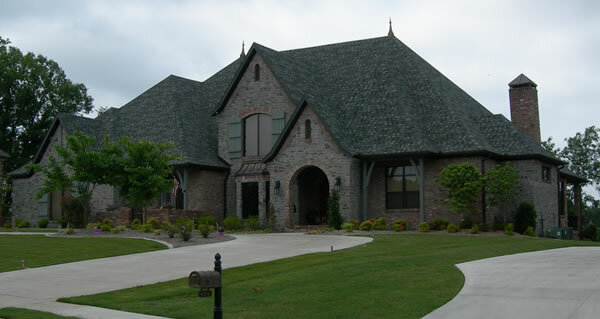 The exterior of this home is faced with a combination of stone and brick veneer, including the arched openings in the windows, entry porch, and garage openings. Wood shutters and wood trim details contrast with the earthen materials, softening the facade as well as accentuating the brickwork. This house features terrific views to the rear, from the great room, the kitchen and nook, the study/office, and the master bedroom. And all have access to a covered porch that spans the width of the house. There's a second level in the middle of the house that has a family room and a home theater.